Grant Success for the Denbigh Borough Charters! We have recently received some great news that our application to the NMCT has been accepted. 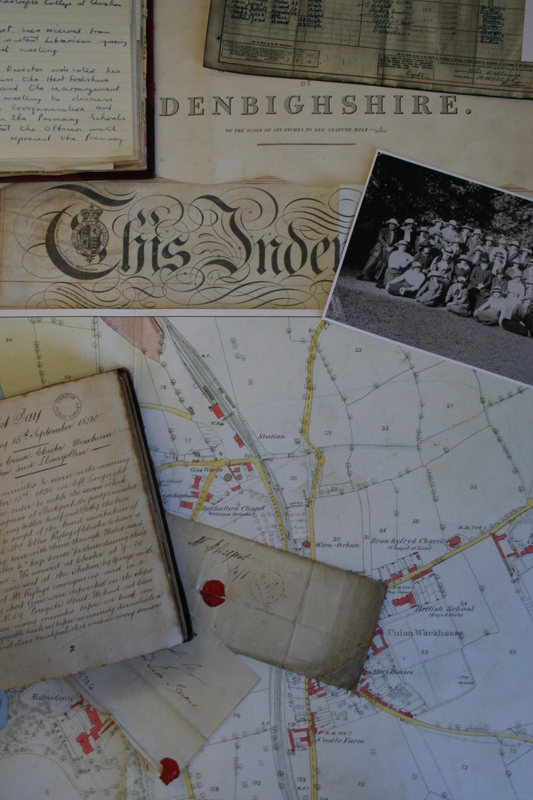 The grant will cover the cleaning, repair, repackaging and scanning of the Denbigh Borough Charters (BD/A). The Charters granted to the Borough of Denbigh are the oldest surviving borough charters in North Wales. They provide rare evidence of Wales during the early-mid medieval period, and form a comprehensive record of an important medieval town’s development from a post-conquest Edwardian settlement to a sophisticated structure of administration under Charles II. The collection comprises of five charters which were issued by reigning monarchs between c. 1290 and 1662. The earliest charter, granted by Edward I to Henry de Lacy, is dated around 1290 and is our only document written in Norman French. Borough Charters were impressive documents designed to be visually attractive. The collection represents the best illuminations of this type in our collections and perhaps in Wales. The charters include fine illustrations of Henry VII and Henry VIII. Rather than sign the document, a royal seal was attached to confirm authenticity. Seals are attached to four of the five Denbigh Charters. Charters were prestigious documents which laid out the duties and privileges granted to the town and burgesses (borough officials). The matters covered in a borough charter included rights to self-govern such as the right to hold courts, regulate markets, build town walls etc. NMCT grant funding will mean that these impressive documents will be professionally repaired and cleaned and bespoke packaging will be made to protect the manuscript and attached seals. The grant will also cover the cost of specialised scanning to enable researchers to access them online. This is our third successful conservation project funded by the NMCT in the last five years including work on our Tithe War Album and our Criminal Description books. The Temperance Movement was a popular social movement during the nineteenth century which criticised excessive alcohol consumption and advocated abstinence. The early movement had arisen from the problems caused by the popularity of cheap spirits and gin houses, but during the 1800s when safer alternatives to beer became cheaper and more readily available emphasis turned to teetotalism and tea and cocoa rooms began to appear in our towns. We have two wonderful examples of temperance posters created in Rhosymedre, near Ruabon around 1880, which were deposited during the 1980s (DD/DM/608). The posters are hand coloured and include a pro-temperance illustration of a tree entitled “The Tree of Health and Happiness” and anti-alcoholism illustration of a tree entitled “The Tree of Misery and Death”. They both depict a group of people standing beneath a tree, and making appropriate comments on the benefits of sobriety and the perils of inebriation respectively. The trunk and branches of each tree are also labelled with appropriate sentiments which make interesting and quite amusing reading for modern eyes. Unfortunately the fragile condition of the posters meant that they were unfit for the public to view or handle. In the past they had been folded into eighths and these folds then opened into splits. The posters had been previously framed and resin staining had leached into them and they were heavily discoloured. However the most serious problem was that during the last few decades the posters had been heavily repaired with sellotape or similar, and strips of this adhesive tape covered most of the rear surface of each. The tape had begun to oxidise, discolour and lose flexibility so it was no longer possible to unfold the posters and or flatten them. The posters were in desperate need of conservation work and were sent to an external conservator for treatment. First the printing inks were tested for stability in acetone then the adhesive tape and as much as the adhesive as possible was removed with local then overall applications of acetone. Discolouration was reduced by pre-wetting the fragmented paper with an ethanol/water mix then washing in ordinary water. This was continued until no further discolouration came out. Tests were carried out with low concentrations of hydrogen peroxide solution on those areas still heavily discoloured but to little effect. The posters were pieced back together on a light box using Japanese tissue and wheatstarch paste then each lined onto a sheet of Japanese mulberry paper with wheatstarch paste and stretched flat. Missing areas were filled with a rag paper applied with wheatstarch paste then these and any visible repairs were toned with watercolour. These wonderful posters are now available to view at Denbighshire Archives in Ruthin.